Feathers were an important aspect of the Maya, Inca, and Aztec cultures. They were so valued that they were used as currency. Archaeologist tell us that they were traded long before the arrival of the Mayan people. They further enlighten us by telling us that these earliest cultures utilized professional hunters whose sole responsibility it was to hunt the rarest of feathers. Macaw feathers are frequently discovered during excavations, and they have even been discovered during ancient Anasazi excavations in Chaco Canyon, in northern New Mexico. These feathers date back to 800 AD. The northern most aviary ever discovered was found in Chihauhua, Mexico. They believe that this was an ancient macaw breeding site. We know that both they Maya and Aztec bred and raised colorful birds in aviaries. In fact, Montezuma, the Aztec emperor, had an amazing aviary within the confines of his palace. Every color of feather imaginable could be found in the aviary, and the feathers came in all shapes and sizes. One of the most prized came in five different vibrant colors. The feathers in the aviary were reportedly harvested like fruit. It is believed that many of these species are extinct today. In addition, Montezuma maintained a series of lakes. These lakes employed 300 men whose main job was feeding the flocks of birds that inhabited them. Each of these lakes featured a different bird, and at least one of them was stocked with flamingos. Both Aztec and Mayan men loved to wear feathers. In addition to headdresses and mosaics, they made shields, fans, coats, capes, ear rings, emblems, and sandals, from them. The featherworkers used a wide variety of methods for attaching the feathers. These include glue, crimping, and sewing. Bird feathers were also used in the decorating of homes. Aztec palaces used featherwork to cover window and doorways. They also displayed intricate feather and butterfly mosaics on their walls. Feathers were interwoven with cotton to make these textiles. All three, the Maya, Inca, and Aztec made a very fine textile out of feathers. This work was described as being very intricate. The most highly sought feathers came from the macaw, parrot, hummingbird, and quetzal. Macaw feathers came in red, blue, green and yellow colors. Quetzal feathers, which are bright green and blue, were the most prized. 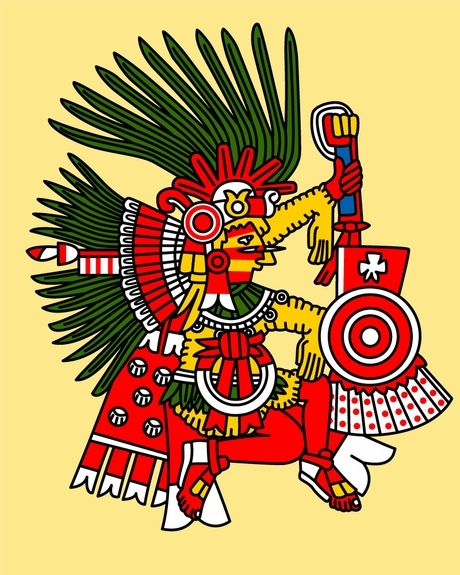 The word quetzal is Aztec in origin, and in their native language of Nahuatl is means, “feathers, precious, and beautiful.” In some cultures only the king and his family were allowed to wear and use quetzal feathers. The first time when Cortes met Montezuma he was in a litter which was carried on servants shoulders. The litter was decorated in gold tassels and quetzal feathers. Shortly afterward, Montezuma gave both King Charles V and Hernan Cortes capes made from quetzal feathers and gold. The Inca also prized the macaw and quetzal. Largely, they made clothes from them. Historians tell us that Inca dancers and entertainers wore elaborate costumes made from macaw and parrot feathers. They also tell us that the Inca royalty greatly prized the bright green quetzal feather. However, Inca royalty also wore capes, cloaks, and tunics made from bat feathers. The Spanish described the clothes as extremely soft and delicate.